Especially for Mums wanting to have a vaginal birth after c-section! My little Isla Raine was born 2 months ago and I feel ready to share my hypnobirthing story with you all and hopefully inspire more positivity, especially for Mums wanting to have a vaginal birth after c-section! Love reading everyone else's positive stories! Isla is my second baby and I had successful and very fast VBAC birth! I had been listening to the birth affirmations and meditation tracks all throughout my pregnancy right from about 18 weeks and also really visualised body opening easily. I would stand in the shower and close my eyes and "feel" my body softening and opening and would try and picture a quick and simple birth. I would also close my eyes and see and feel all my different muscles and visualise them all working together perfectly.. and it worked! I just wanted to take the opportunity to share my birth story with you all after successfully giving birth via VBAC yesterday morning at 8:20am on 8th of Feb to our beautiful little girl Elaina Rosalind Carmody. 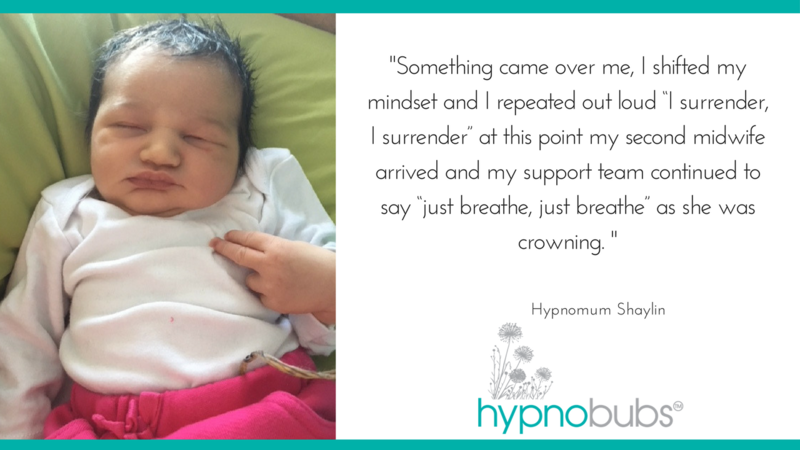 I love Hypnobirthing mainly because it is so empowering. I hypnobirthed for my first, 2 years ago and unfortunately ended up having a C-Section but I made the best choices for me and my baby at the time. Second time around I was determined to have a natural birth so we got private health cover, chose a great doctor and headed to Perth at 38 weeks to wait for the day bubby decided to arrive. Hypnobub, Adeline was born via VBAC 54 hours after my membranes released spontaneously at home. This was my first time in labour. Hubby and I went to the hospital twice during the 40-hour long early labour. In hindsight, going back home asap would have progressed things. The hospital was stressful on the 2nd visit - midwife couldn't say what the spotting meant, constant fiddling with CTG and telemetry as the discs are not made for pregnant tummies! During one contraction, the CTG trace moved from baby's heartbeat to the cord - midwife freaked that the baby's heartbeat had dropped rapidly and called an emergency team. They gave me 2 courses of antibiotics due to membranes releasing 24 hours earlier - which I later found out was unnecessary. The ob registrar was negative about my having a VBAC as a VE revealed cervix was 1cm long and 2cm dilated (to me, this was progress!). She offered me a Caesarean. Just like with my previous two babies my membranes ruptured in bed at night. It was 1.30am. The baby was wriggling around a lot, and, as I had been for weeks, I was experiencing a lot of Braxton Hicks. At our weekly obstetrician appointment 2 days earlier during our scan our OB had told us the baby was well engaged and he expected me to be in labour within 48 hours, he even offered an internal to check dilation, which I refused! (I don’t need to know “progress” It’ll happen when it happens!). 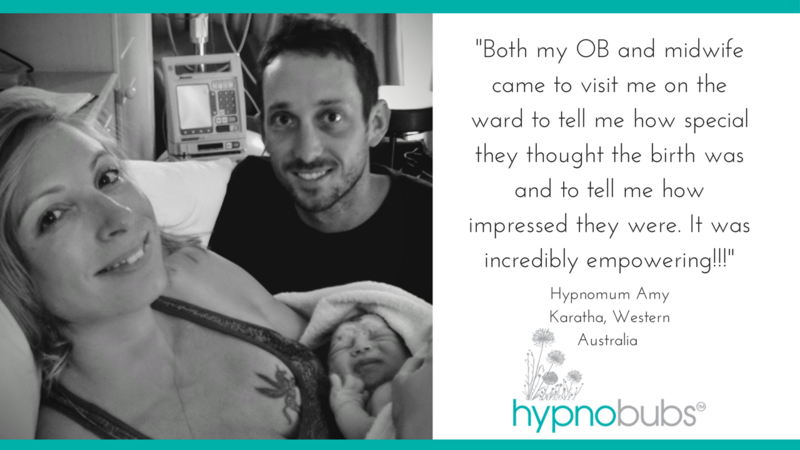 Hypnobirthing 2nd time around... how choice of care givers can make a HUGE difference! 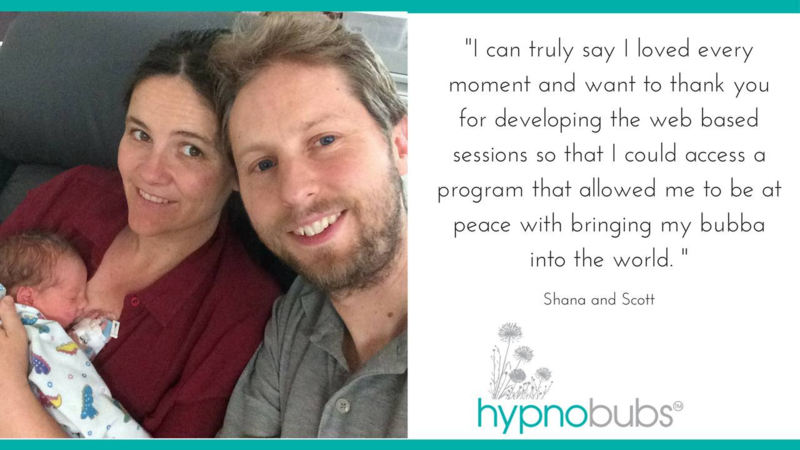 Thank you from the bottom of my heart for your efforts in promoting hypnobirthing and your hypnobubs online course. You played a role in the healthy, happy and completely natural delivery of my beautiful daughter in October last year. This letter may be longwinded but please bare with me! 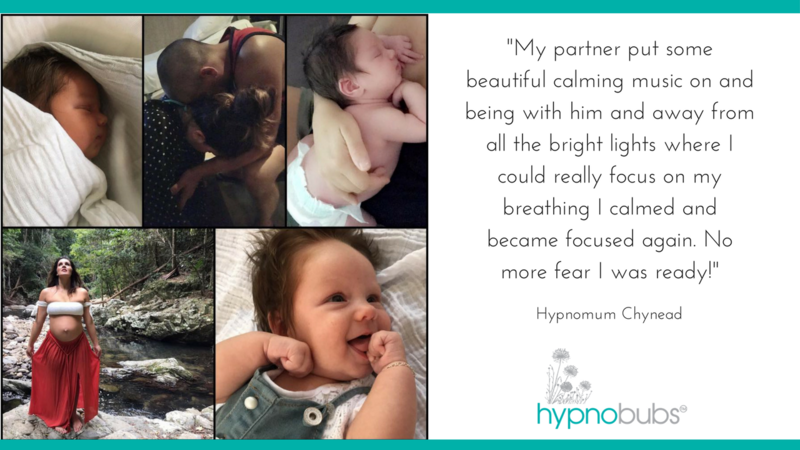 I have always been into eating healthy and trying more alternative approaches so when I fell pregnant with my son back in 2015, I looked into hypnobirthing. I came across your online course and bought it straight away. I printed out all my material, studiously completed the course, got my partner involved and practiced every day in the car on the way to work. I loved the approach and believed in it whole-heartedly. I actually can’t thank you enough for the impact that the course had on my delivery. I was a very cool cucumber during the whole procedure, even when Theo had trouble breathing and I lost a lot of blood. Unfortunately he couldn’t be placed on me in theatre but we did seeding straight away which was good. From the work I did, I knew that I/we were safe and where I needed to be. I was anxious beforehand, but as soon as the spinal and epidural were both in, I became very calm and focused. It was amazing. Thank you so much for allowing me to trial the online program, it truly allowed me to have the most amazing experience. I often receive messages from mamas that I have taught, asking for guidance in choosing some music for their birthing playlist. Parents often ask for the details of the artist of the background music from of our Hypnobubs™ tracks. Christopher meditates himself, so I know that he is coming from a very authentic place when creating his beautiful music. He also feels very honoured to know that mamas listen to his music during such an important time in their lives and that his compositions are often the first strains of music that a baby hears when they come from the womb. 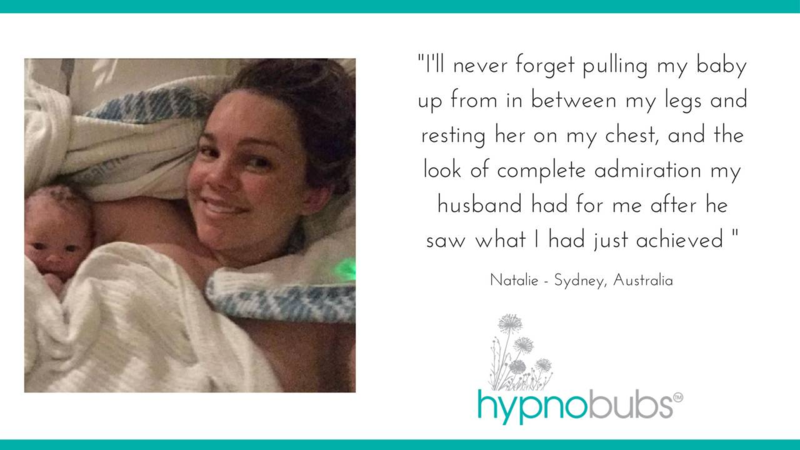 Because Hypnobubs and Hypnobirthing Australia mamas listen to our hypnobirthing tracks all throughout our pregnancy and birth; we become conditioned and associate the background music with the messages of deep relaxation given in the words of the tracks. My baby boy Ari is now 3 months and time has slid by at an astonishing rate. It feels like yesterday I was eagerly awaiting the chance to meet him. Our day was heart stopping and I felt so proud to meet him. I have two other children and their births were amazing but for both I experienced fear and pain and ended in epidurals and I wish I could go back and tell my younger self how to make our birthing days as easy and relaxed as Ari’s. I had a tricky pregnancy where I was told I had lost my baby on no less than 3 occasions, admitted for observation at 34 weeks and being pressured to induce from 35 weeks on. I was a mess when I decided to look for something to give me back my power. 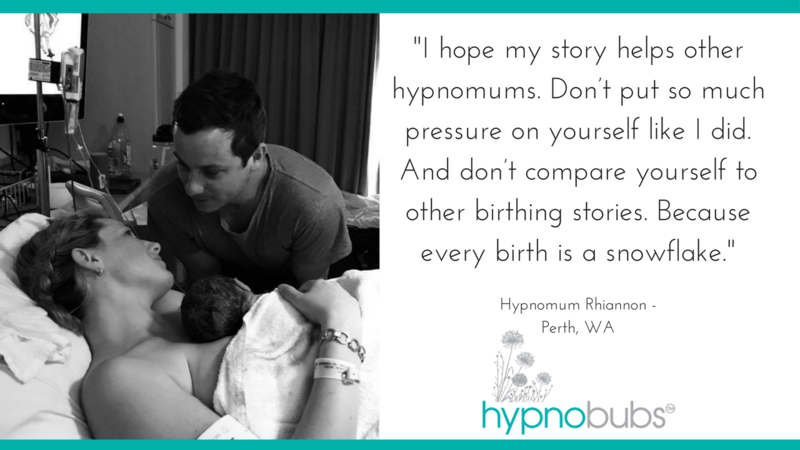 Hypnobirthing was a powerful gift that guided me through a rough time. So I had to have an induction at 36 weeks and was admitted into hospital the night previous to our day. My partner went home and I spent the night meditating as I was too excited to sleep much. I manifested the birth of my dreams! It started at 5.22am I felt liquid come out of my vaginal canal and thought this may be it. The body was 41 weeks and 5 days. I went to the toilet and felt a little more liquid come out, then about 30 minutes later my surges started really gently. I knew it was my membranes releasing as the liquid started releasing more and more and the intensity of my surges increased. I would flop my body on the wall at home. Welcome to the world yet another hypnobub! Eliza was born yesterday after a quick and speedy delivery in the hospital birthing pool. My membranes released almost 24 hours before her birth, and that whole day I just focused on being relaxed and used all of my techniques learnt through the Hypnobubs online course Affirmations for beautiful birthing were mostly my 'go to' track. The birth escalated very quickly that evening, after my parents finally arrived at our house to look after our two-year-old daughter who we had to put to bed, we made our way into the hospital and by the time I had got there I was already 4 cm dilated. I continued to use my breathing techniques which relaxed me so much that I progressed very quickly.